Carlos turns a terrorist’s life into an epic encyclopedia entry. The most obvious question about the 338-minute version of Carlos is actually the wrong question. While a potential viewer might wonder whether more than five hours is needed to explore the life of notorious terrorist Ilich Ramírez Sánchez, code name Carlos—especially when there’s also a 140-minute version of this film making the rounds to some theaters—you could find that much good stuff in the life of pretty much any intriguing historical figure. Give a gifted filmmaker like Olivier Assayas (Summer Hours) that much time to explore a character, and you could wind up with something as compelling in its scope as HBO’s John Adams. That conclusion, however, assumes that the goal of the filmmaker isn’t simply to provide a historically comprehensive guide to his subject’s life. If that’s all you wanted, you could spend the same five-hours-plus reading a good nonfiction biography—or hell, spend 10 minutes reading the Wikipedia entry. A cinematic experience has to deliver more than a moving encyclopedia, and Carlos too rarely transcends that sensibility. The story opens in 1973, with the young Marxist Carlos (Edgar Ramírez) joining up with the Popular Front for the Liberation of Palestine, headed by Wadie Haddad (Ahmad Kaabour). He quickly establishes his bona fides as both foot soldier and tactical leader, and is assigned by Haddad the position of heading an assault on a meeting of OPEC countries in December 1975, with the goal of assassinating the ministers of Saudi Arabia and Iran. But when Carlos changes the plan on the fly, he risks alienating his organization, and finds himself going freelance. be as much of a grinding bore on screen as they can be in real life—and for a while, it looks like that may be all Assayas has up his sleeve for his portrait of Carlos. Early on, we see him in a bar offering passionate commentary about uniting revolutionaries worldwide. But while Carlos may be fiercely devoted to the struggle against imperialism, it also becomes clear that he’s pretty devoted to himself—a notion Assayas plants when we see him admiring himself naked in a mirror. 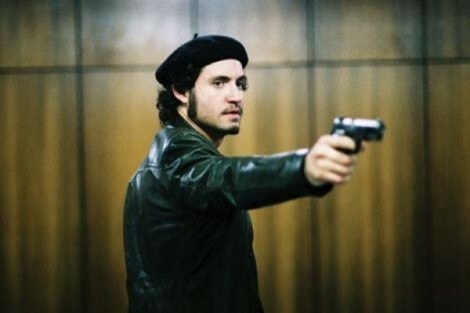 Ramírez does a fine job of embodying Carlos’ swaggering self-confidence as he becomes the terrorist equivalent of an egomaniacal international rock star, a guy who demands blind obedience from a prospective new recruit just after we see him assert his own need to disobey orders during the OPEC raid. But Assayas really isn’t interested in putting Carlos on the couch to dig into his psyche; that’s really just the interior decorating on a production devoted mostly to re-creating events. It doesn’t take long to figure out that Carlos is going to throw mountains of details at you, since virtually every new character who appears is accompanied by an onscreen caption explaining their real name, their code name, their position within whatever organization is applicable, etc. Assayas can devote nearly an hour to the particulars of the OPEC mission, because he’s got the screen time to spare, and there’s certainly some tension in watching Carlos’ cohorts begin to question his decision-making as the plan goes awry. Mostly, though, the catalog of people, places and events just keeps coming, without an overarching sense of the point of it all. The pace quickens as Carlos moves into the later half of its subject’s public life, but the results are still uneven. Assayas devotes some time to the bumpy relationship between Carlos and his first wife, Magdalena (Nora von Waldstätten), and finds some interesting material in the way Carlos finds his allies disappearing in the wake of the Soviet bloc’s collapse in 1990. Yet even as we watch Ramírez effectively playing a one-time legend unwilling to deal with the reality that he has become a relic, it’s hard to push through the forest of facts and figures. The “who” and “what” of history is enough if all you want to do is be factually accurate; drama needs to make us care more about the “why.” And it needs to make us believe that our time wouldn’t be more efficiently spent on Wikipedia.